Well, another Sportsday is over. We've heard from some big Premier League guns today, Claudio Ranieri and Guus Hiddink among those speaking to the media. It's more of the same tomorrow, with Manuel Pellegrini, Arsene Wenger and - if he can stand up long enough - Louis van Gaal among those holding press conferences. It goes without saying we will have them all for you. 2012: The Gary Speed Memorial Match took place at the Cardiff City Stadium, ending Wales 0-1 Costa Rica. Arsenal's Joel Campbell got the goal on an emotional night of football. Brady to play till 42? The New England Patriots and quarterback Tom Brady has reportedly agreed to a two-year contract extension through the 2019 season - when he will be 42. According to ESPN, Brady's salary-cap charge for 2016 was scheduled to be a team-high $15 million and the extension would lower that number. Brady, who turns 39 in August, has two years left on his existing contract, paying him $9 million in 2016 and $10 million in 2017. The four-time Super Bowl champion has always maintained he could play well into his 40s. Here’s one for the football hipsters (and for the curious). If you are very much pro-Europe – in a footballing, not political, sense of course – then head over to BBC Radio 5 live from 21:00 GMT tonight. Mark Chapman is presenting the European Football Show, with topics of discussion likely to include Cristiano Ronaldo and his seemingly-disparaging comments about his not-so-famous team-mates (link: http://www.bbc.co.uk/sport/football/35679497), the race for the Bundesliga golden boot and whether Juventus manager Massimiliano Allegri should be catching Chelsea’s eye. Ooh la la! Don’t miss it. Fox Sports (via the Daily Express) reports that former England manager Fabio Capello claims fellow Italian Antonio Conte, who is expected to be named Chelsea manager, is already "preparing" for the Stamford Bridge job. Valencia boss Gary Neville called it "scandalous" while Chelsea said the ball"clearly crossed the line". And if you want to see the kind of thing Hunt does, check this out. If you're scared of heights, it's best to look away now. Great Britain's Gary Hunt claimed victory in the first FINA high diving World Cup of the year. The 31-year-old world champion led throughout the event in Abu Dhabi and finished with a score of 639.30, 60 points clear of his nearest rival, Jonathan Paredes of Mexico. Hunt's compatriot Blake Aldridge came fifth with a score of 558.45. Want an idea of why losing N'Golo Kante to injury is such a big blow for Leicester? This may give you an idea. Celtic will appeal against the red card shown to Dedryck Boyata in the draw at Hamilton Academical despite manager Ronny Deila having criticised the defender. After Friday's game at New Douglas Park, the Norwegian had said he agreed with referee Craig Thomson's decision. But Deila has changed his mind after reviewing television footage. "I have seen it many times and, when you've seen it from all angles, it's the wrong decision," Deila said. Canada's Davis Cup hopes have received a double blow after world number 13 Milos Raonic and top doubles player Daniel Nestor pulled out of next weekend's first-round tie against France. Raonic withdrew from the world-group tie - which starts on Friday - as he is still recovering from an adductor tear suffered at the Australian Open. Nestor, the number 12 ranked doubles player, ruled himself out due to a last-minute family matter. 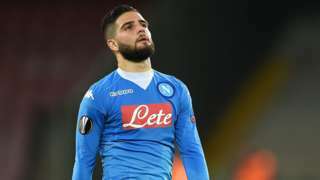 Napoli striker Lorenzo Insigne is robbed at gunpoint and then asked by the thief to dedicate a goal to him, his agent says. Daily Star: Manchester United are weighing up a move for Hull left-back Andrew Robertson but Arsenal, Manchester City and Tottenham have also been watching the 21-year-old Scotland international. Sauber's Marcus Ericsson says the team can take a "step forward" this season despite competition "becoming fiercer". Swede Ericsson, 25, begins his second season with the team after finishing 18th in the drivers' standings last year with nine points. "This season I'd like to see us being in contention for points and fighting on a level where speed is decisive," said Ericsson. "I'm convinced that we're going to take a step forward." In addition to the Davis Cup tie in Birmingham - against Japan, starting Friday - three British women are playing tour events this week. Johanna Konta and Heather Watson are in Monterrey. Watson plays her first round match against Misaki Doi at 19:00 GMT. Konta is up against Mariana Duque-Marino from about 01:00 on Tuesday. Naomi Broady, meanwhile, is playing in the main draw in Kuala Lumpur. She starts Tuesday against Klara Koukalova.